I was completely at a loss. The teachers were chanting the whole time and didn’t offer any kind of introduction or provide any printed lyrics to read from. I sat there breathing the heavy incense smoke and feeling totally awkward until it was time to leave. Now I know that I’d stumbled upon a Kirtan, but without any idea of why we were doing this practice it was a pretty tough way to start out. I left that class thinking that yoga was not for me. It took a few years before I tried taking another class. This time it was with a different teacher at another studio. The format was much closer to something that I could wrap my mind around. It was like a gentle dance class and the final meditation was simply wonderful. The teacher was a sweetheart who would always greet her students with a hug. The gems of wisdom that she taught made a lasting impression on me. After a few classes I was hooked and it became my mid-week ritual. I wanted to share the experience but couldn’t find anyone to go with me. I remember stopping by the town bar before class and trying to rally a few friends to go with me (yeah, no luck there). People were either too tired or just not interested. So I kept going by myself every week. I recently met a woman who told me point blank that she doesn’t like yoga. She’d only been to one class and said that was enough for her. She coaches a high school girls basketball team and believes that she’s too competitive for yoga. She also admitted that she didn’t like being singled out by the teacher who was giving corrections during class. I completely understand where she’s coming from, but I still hope that she can find her way to another class someday. She could probably benefit from one-on-one training, where she wouldn’t have to worry about feeling competitive or embarrassed. Ultimately she is the only person who is going to change her mind. This is a common issue with group yoga classes, where first timers decide to try a class with no idea of what to expect and get burned out from the experience. If you’re new to yoga I encourage you to try a few different styles. 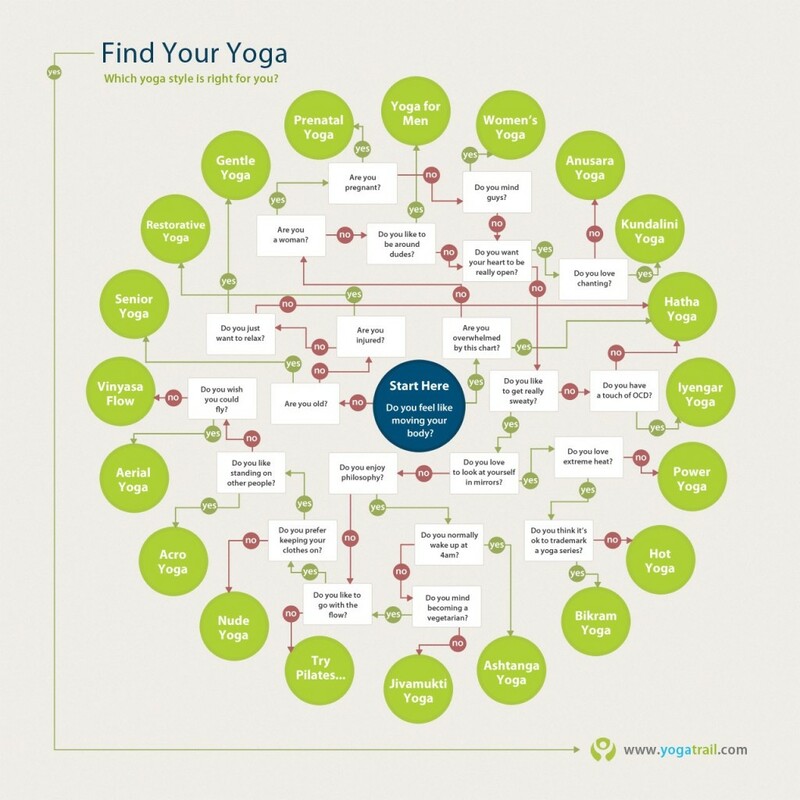 You might find this flow chart handy as it could give you an idea of what kind of yoga class would be right for you. With Emily’s encouragement, the new chapter in my life book in New Paltz, New York included classes in strength and flexibility (with Avi)and beginning yoga(with Michael). A great mix and a perfect introduction to health and fitness. Thank you all!